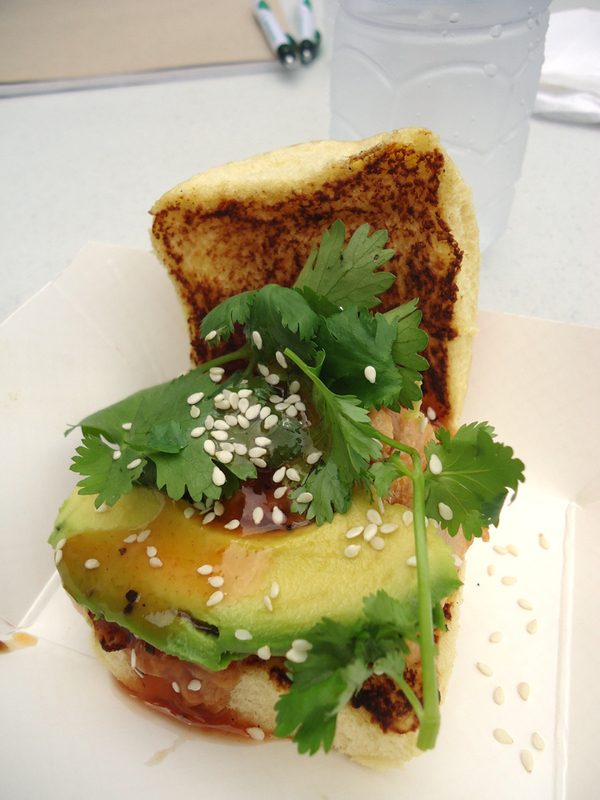 The News & Observer hosted a Food Truck Friday last week lunch on June 1. Three trucks were serving food, Chirba Chirba Dumpling, KoKyu and Sympathy for the Deli. Six of my coworkers and I walked a few blocks from our office to the N&O parking lot to get our grub on! 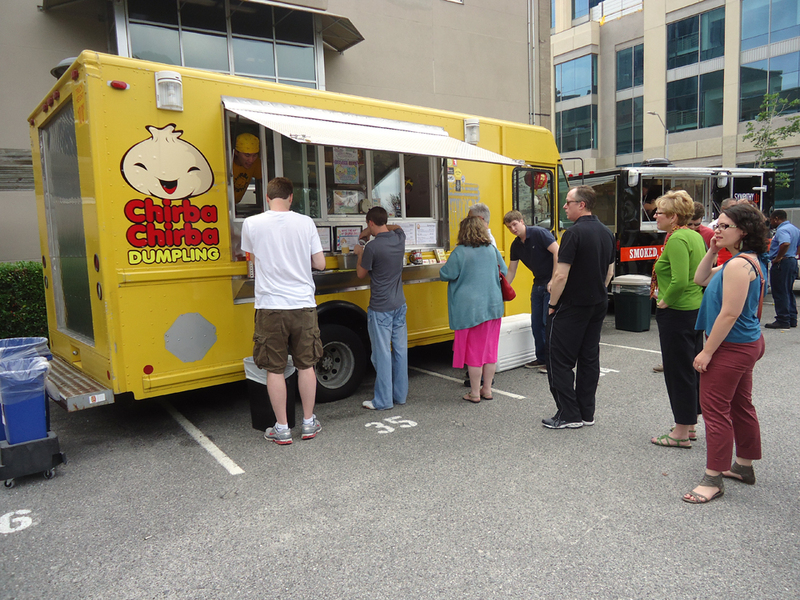 The food truck lines started getting crowded as hungry employees emerged from their cubicles. Andrea and I decided to split a few foods from Chirba Chirba Dumpling and KoKyu . 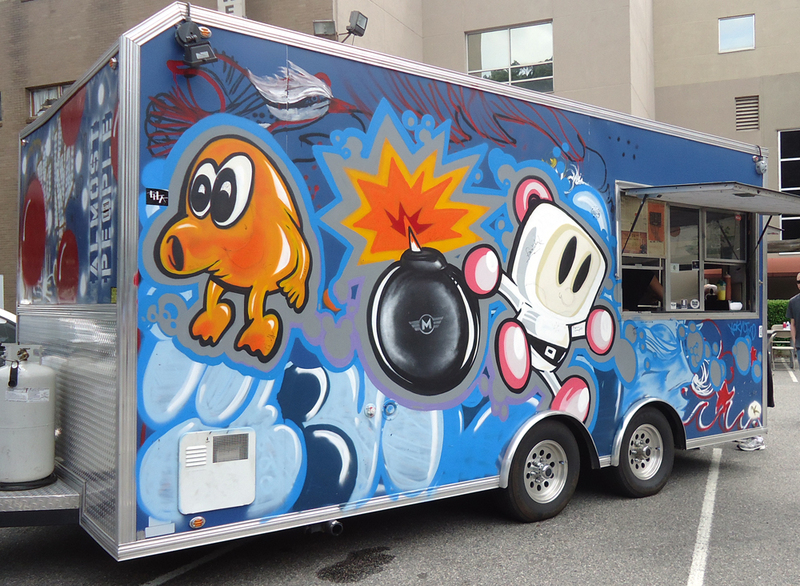 While Andrea was ordering from Chirba Chirba Dumpling, I stood in line at KoKyu and admired their truck decorated with graffiti art. After debating over the rather large menu for a food truck, I ordered the Carolina carnitas slider and Korean BBQ taKo (yes, taKo with a “K” because they are Korean). The friendly employee handed me a 4 of hearts playing card. A few minutes later I hear, “4 of hearts, 4 of hearts” coming from the KoKyu food truck. I returned my playing card, picked up my food from the window and joined the rest of my coworkers. Paul ordered the duck fat tots from KoKyu and he was nice enough to share with everyone. The tater tots are fried in duck fat and seasoned with rosemary and black pepper. 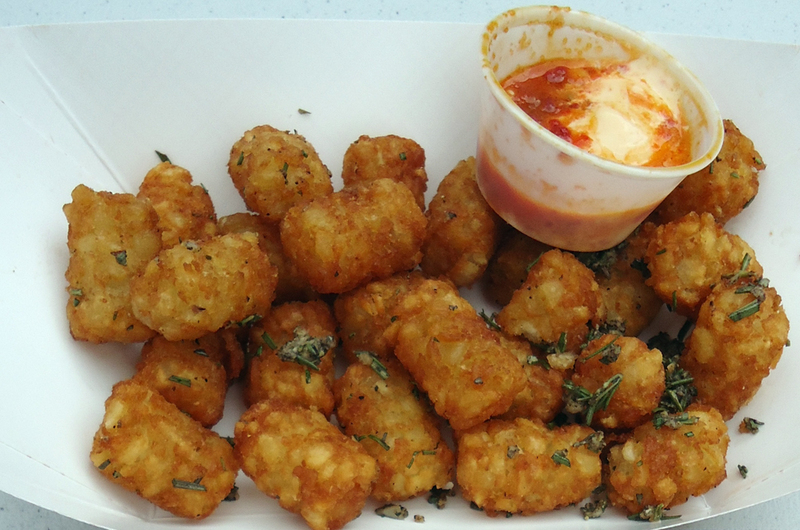 The tots are accompanied by a delicious spicy, creamy dipping sauce. If you have the opportunity to visit KoKyu, bring a friend and split these rich, mouth-watering tots. The Carolina carnitas slider was amazing. The vinegary shredded pork paired nicely with the sesame sauce, avocado and cilantro. Korean meets North Carolina in just one bite; I could have seriously eaten twenty of these sliders. 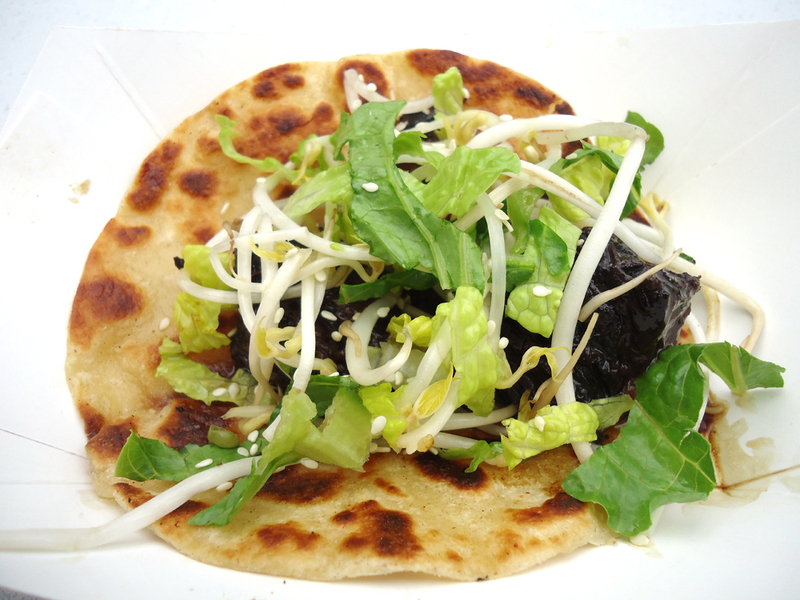 The Korean BBQ short rib taKo was also delicious. Definitely grab a handful of napkins because the taKos are quite messy, in a good way of course. The meat on the taKo was tender and had a great charred flavor. 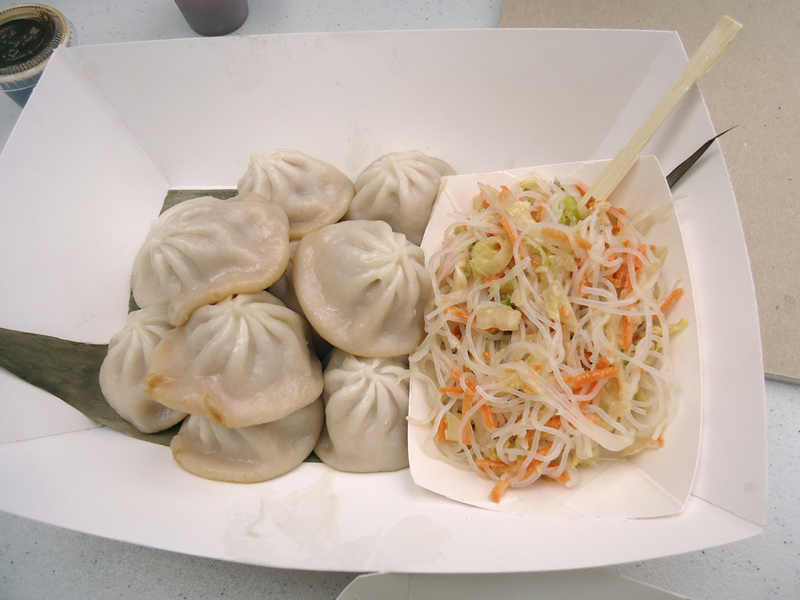 Andrea ordered the juicy buns and glass noodles from Chirba Chirba Dumpling. The pork inside of the steamed bun was quite flavorful. There were also a wide variety of sauces to use for dipping; my favorite was the pineapple sauce. We were going to try out Sympathy for the Deli next but we were just too full from the other two trucks! Make sure to follow KoKyu, Chirba Chirba Dumpling and Sympathy for the Deli on Twitter. Food trucks are always on the go (obviously) and you’ll need to follow them to figure out where they will be serving up some fantastic food next in Greater Raleigh!